Lusitania also harbors the descolada, a virus that kills all humans it infects, but which the pequininos require in order to become adults. The Startways Congress so fears the effects of the descolada, should it escape from Lusitania, that they have ordered the destruction of the entire planet, and all who live there. The Fleet is on its way, a second xenocide seems inevitble. Now then. This is the part where I am suppose to weigh in with my thoughts, or say something witty about the book. But since the book in question is still buried deep in my TBR pile, I'll leave the weighing in to those familiar with the story. Anyone? Sorry I can't offer my thoughts, being yet to read it myself, but this is the second post in a row I've read highlighting a word I've only just heard of. I love discovering things through the Challenge! Xenocide... I'm guessing this has something to do with "death of foreigners". That is, based on my rudimentary knowledge of Greek (Xeno- "foreign" as in xenophobia "fear of foreigner", from Xenophon, the Athenian historian) and Latin (-cide "kill"). I knew my schooling wasn't for nothing! PS, the girlfriend has finished you books and had some really interesting things to say about them. I'm just trying pushing her into writing a review! Oh, turns out she already did! 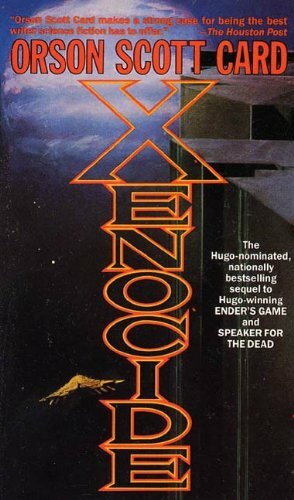 "Xenocide... I'm guessing this has something to do with death of foreigners"
You're close. According to the books wikipedia page, a xenocide refers to the mass murder of an alien race. "PS, the girlfriend has finished you books and had some really interesting things to say about them." Sorry, I haven't read it either. I haven't read Ender's Game or any other Orson Scott Card. But like Orson Welles, his name sounds much better when you substitute "Awesome" as his first name. Also makes great slang! LOL. Yeah. It definitely does. I read this a good long while ago. I really need to go back and read again. Especially if you recommend it.